★ He'll be a hit at the playground in this fun and playful baseball cap featuring colorful animal critter imagery. 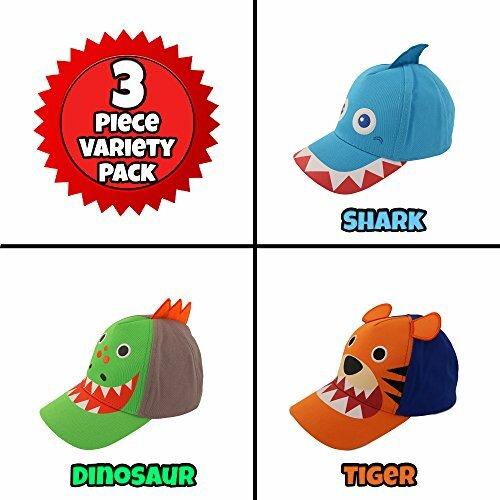 ★ The cap comes in a choice of Orange-Blue Tiger, Blue Shark, Green-Grey Dinosaur style or in a 3 piece variety design set. ★ Cheerful animal critter imagery with embroidered details on the crown and brim and dimensional cotton twill ears give the hat eye-catching appeal your little guy will love. ★ Designed for boys aged 2-4, this hat features a Velcro closure for an adjustable fit. ★ Durable cotton twill material and an inside sweatband provide breathable comfort, while the curved brim helps to keep the sun out of his eyes. ★ With a selection of popular animal critters in unique, vibrant styles, he's sure to find a favorite cap among the ABG Accessories Critter Collection. ★ FUN AND PRACTICAL: He'll be ready for all his daily activities with this fun, uniquely designed baseball cap. Stylish and comfortable, this animal critter accessory is a great gift that boys will love for sunny days. ★ CRITTER DESIGN: Toddler boys baseball cap featuring fun and colorful animal critter imagery from the ABG Accessories Critter Collection. ★ AVAILABLE IN CHOICES OF: Orange-Blue Tiger, Blue Shark, Green-Grey Dinosaur or a 3 piece variety design set. ★ PREMIUM QUALITY: Comfortable 5-panel baseball cap is made of durable cotton twill. Features a curved brim with colorful animal critter imagery on the crown and brim, dimensional cotton twill ears, embroidered details, inside sweatband and an adjustable Velcro closure for easy adjustments. ★ SIZE: Adjustable fit with easy-to-use Velcro closure designed for toddler boys age 2-4. ★ Approximate crown dimensions: 7" (L) x 7" (W) x 6" (H) - 51 cm circumference. Brim is 2.4" (L) x 6" (W). ★ CARE INSTRUCTIONS: Hand wash cold with like colors. Non-chlorine bleach. Lay flat to dry. Do not iron. ★ AUTHENTIC PRODUCT: Quality designed product by ABG Accessories Critter Collection. If you have any questions about this product by ABG Accessories, contact us by completing and submitting the form below. If you are looking for a specif part number, please include it with your message.